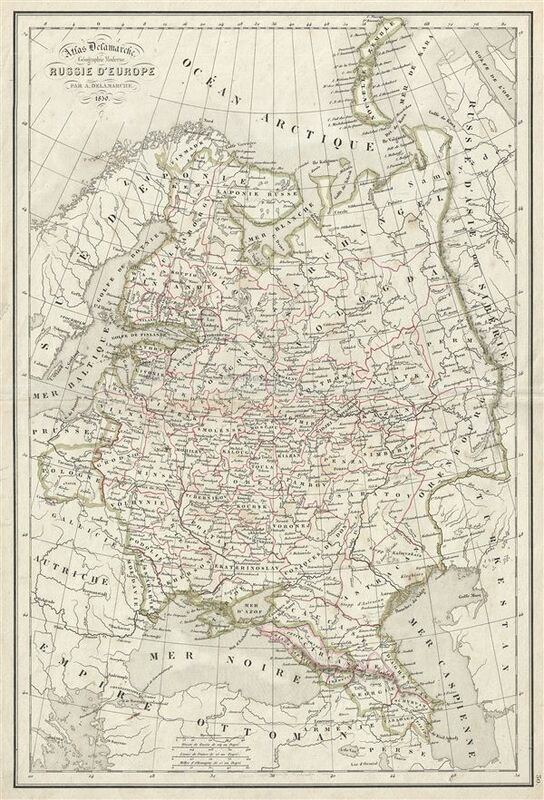 This is a beautiful example of Alexandre Delamarche's 1850 map of Russia. It covers the european part of Russia from Sweden to the Ural Mountains and from the Arctic Ocean to the Caspian Sea. When this map was printed, Russia was ruled by Tsar Nicholas I who adopted the doctrine of 'Orthodoxy, Autocracy, and Nationality' and was known to be one of the most reactionary monarchs in Russia. In 1825, Russian army officers, called the Decembrists, protested against Nicholas I's ascension to the throne. The Decembrists, so named because their revolt started in December, favored Nicholas I'st brother, Constantine, who seemed amenable to a British style constitutional monarchy. When Constantine abdicated the throne in 1825, the Decembrists refused to accept the more autocratic rule of Nicholas I. Had Constantine not abdicated and the Decembrists been successful, the bloody Bolshevik Revolution may never have occurred. Throughout, the map identifies various cities, towns, rivers, mountain passes and an assortment of additional topographical details. Political and regional borders are highlighted in outline color. This map was issued by Delamarche as plate no. 30 in his Atlas Delamarche Geographie Modern.